The conference will take place at the main campus of Queen's University. 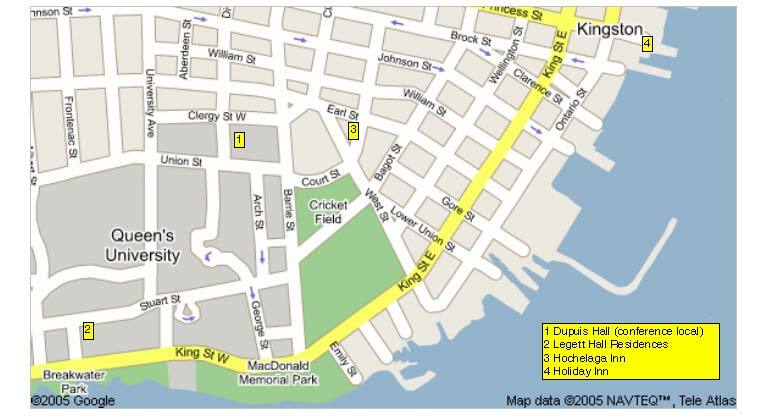 This is within walking distance of downtown Kingston as well as the scenic Kingston waterfront. Note: Kingston is a summer tourist destination and rooms are hard to find on short notice, so please book as early as possible. We have reserved blocks of rooms at the following locations. We have reserved a block of rooms at the Leggett Hall Residence. It is a five minute walk to the conference location. The price is $58.00+tax (Canadian) per person per night bed and breakfast. The block of rooms will be held until 30 days prior to the workshop. After this date guests may book on an availability basis only, and may be provided alternate facilities. We have reserved a block of 15 Two Double Beds room at the Holiday Inn Kingston-Waterfront. The rate is $170.00+tax (Canadian) per room per night. To book a room, please make your own reservations directly with the hotel Reservations Department at 613-549-8400 ext. 2660, by email at reservations@hikingstonwaterfront.com, or by fax at 613-549-3508. Please remember to identify yourself as being with the Queen's Computing Sciences group. The Holiday Inn Kingston-Waterfront is conveniently located in the heart of downtown Kingston on the shores of Lake Ontario. It is a fifteen minute walk from the Holiday Inn to the conference location. The block of rooms reserved for CCCG will be released after July 13, 2006. Hochelaga Inn - Phone: 1-877-933-9433 Prices start at $115. It is a five minute walk from the Hochelaga to the conference location. A block of rooms is being held for CCCG until July 13. Other Hotels & Bed and Breakfast Inns: within walking distance of Queen's University Campus. *Please note that Kingston is smoke-free in all public facilities. Parking is free on the streets and in surface parking lots on evenings and weekends. On weekdays between 8:30 am - 4:30 pm parking is by Queen's permit only. Limited permits are available at Conference and Hospitality office for $11.50 per day. Alternately, guests may use the underground parking lot, which is 1 block from Leggett Hal and costs approximately $11.50 per day, $23.00 weekly, or park at West Campus and take a free shuttle to Main Campus.